Good Friday I headed into the yard to do some raking. Not just raking, but introducing myself and getting to know the lay of the small piece of land that is the yard I’m adopting and caring for. This is the first real day of work I’ve done here and the more that I step into the space and actually sweat in it, the more it sinks in that this is my yard. 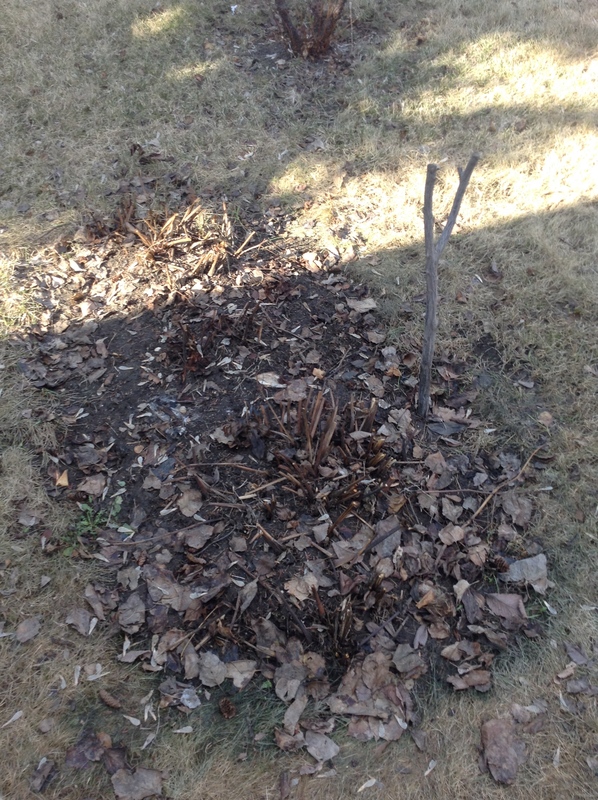 So I started to rake, knowing that I would be putting the dead debris into a pile behind the garden. In my mind I had this image of a set of compost bins neatly in the back, filled with varying degrees of composting matter. But when I showed up at the yard what I realized was the practical, affordable treatment was to just build a pile. So, knowing the minimum is roughly three feet by three feet by three feet, I started trimming back perennials and … wow. I think there’s a bed of peonies! Yup I know, it looks like a pile of leaves. I trimmed back quite a bit of wet and deteriorating leaves and pulled away the bits of rope and wood that were holding the flowers up. You can see one stick still in the ground, that I left in the ground, because you can never know when your’e going to need a long, forked, rough stick. 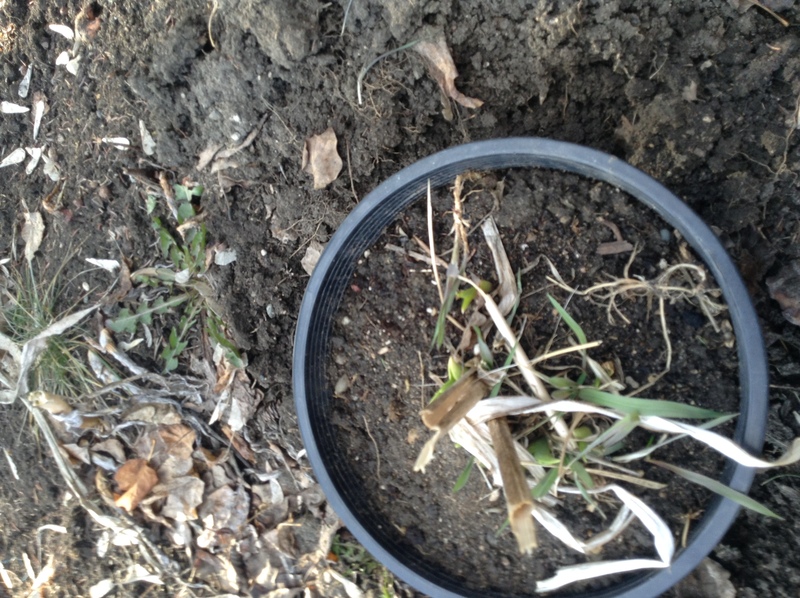 I snipped the leaves down into smaller pieces and spread them on the ground: the bottom layer of the compost pile. Next, I went around to the other bed, and started pulling out dead marigolds, banging off the dirt and breaking them up slightly so I can layer wet, then dry, then wet. That’s when I came across the surprises. 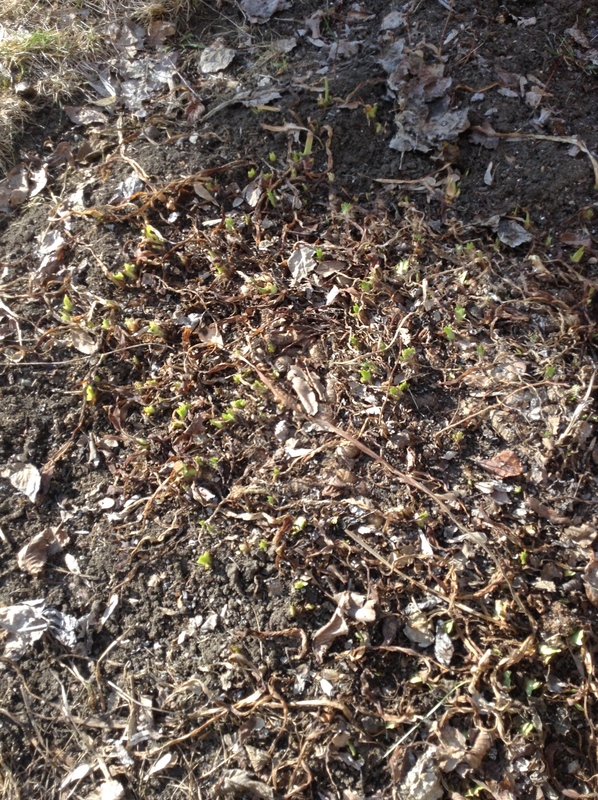 The perennials that already exist, and are starting to poke themselves out of the ground. A mound of iris that is about three feet by there feet, so old that the centre of the mound has gone punky. Ok it’s tough to see. But those little green dots scattered all through the mountain of dirt, leaves, and other debris are the sprouts of the irises that will be blooming for me this year. Even more exciting was the realization that the circular bed with the huge mound cedar in it is also filled with dead leaves….not just any dead leaves, but dead leaves that look like there are at least 60-70 bulbs attached to them. I didn’t touch this bed. I left it exactly as I found it, unable to see anything sprouting as of yet. No doubt in the next few days something is going to poke itself out of the ground as the daytime temperatures are going to climb into the mid-high teens…celsius. And, wonder of wonders, the gas plant looks like it’s actually thriving. Well, as much as you can see at this early stage of growth. The way I’m looking at it, that little lump of green next to the top-left dead branch in the pot has grown at least 3 cm. If it’s still growing, then the roots can’t have been damaged that badly. I’m going to make sure when I put it into the ground with the others that I had potted up to throw in some store-bought compost into the bottoms of the holes to give them a jumpstart. But the best part, the bit that made my heart leap, is that the gas line has been marked. And it goes out towards the north side of the yard and runs along the fence. Which means…. Pond. There gonna be pond. Big pond. Also there gonna be new paint job and yes, new roof. I know. After raking up 3-4 shingles from the flower bed I looked up and gasped a little bit. Ok I gasped a lot. 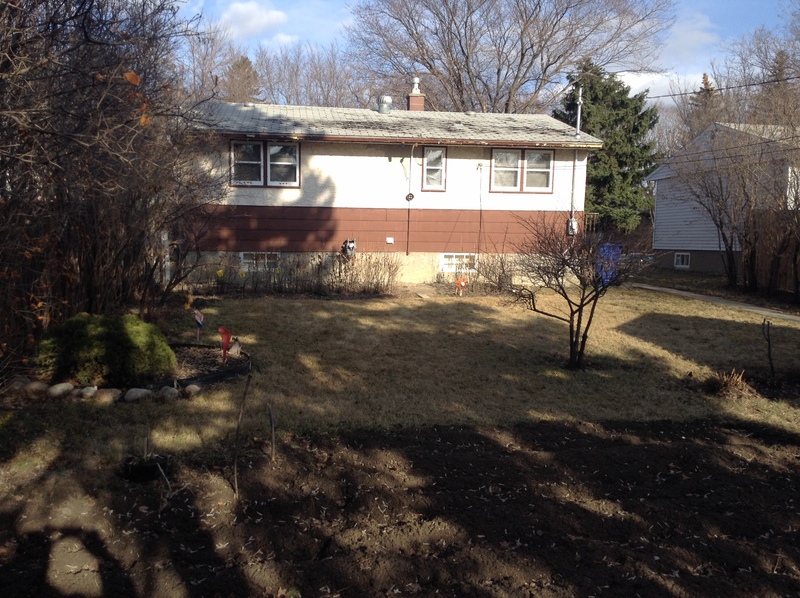 The other thing that came to me is how the sidewalk that runs to the garage is the perfect place for a seating area, maybe a barbecue or a fire pit. Still so much to do, and yet it feels as if this space is becoming mine more and more each day that I work in it. The rocks I collected for the flower bed here at the apartment are going to be lifted, washed, and put around the circular flower bed. The last few lilies that are poking their heads out of the ground here will be lifted and taken over. The really challenging move for me is going to be the wisteria. I’m not sure it will survive, but the reality is that if it stays here it won’t have a chance. White trash don’t care. Just saying. Raking did something else for me. It gave me a better understanding on how the land shifts and moves, where the high spots and the low spots are. A rectangular pond might look good provided the land is flat, but it isn’t. About 3/4 towards the back yard it dips down before the vegetable garden begins, which in the world of ponds does provide a bit of a problem. It may end up having to be a square pond which won’t be an issue particularly. And fish or, what I’m staring to lean towards more, a nature pond with an abundant amount of plants to encourage wildlife, and hopefully in time frogs! Frogs…which sounds like a good idea now, but when there are 100 of them in the pond chirping 24/7 and the neighbours start to complain, and I can’t get to sleep because of the noise….ok maybe a bass or two…. The reality hit me when I was talking with Dave who came out for a smoke and a Pepsi, taking a break from the drywall work in the house. 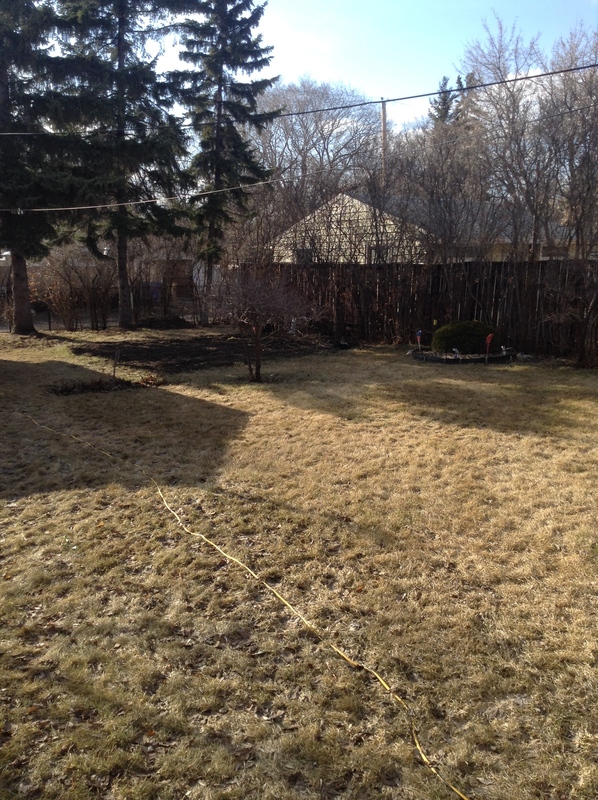 In just a few short weeks I’m going to have to buy a lawn mower. And a few short weeks from that, a lawn chair or two. A week from that, plants can start going into the ground. Then the loan application…then the move. It’s all happening fast, and the really crazy thing is I don’t think about it that often. It’s the first time something huge has happened, begun to happen, and I’m not worried about it. I’m more concerned to be honest about the syringes that have popped up around my flower beds here. Mental note: avoid Boardwalk. Avoid Gladmer Park. Just saying.